Retail Price: $549.95 ONLY: $449.95! 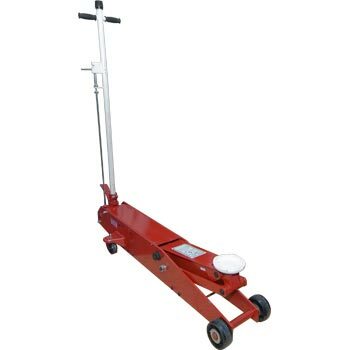 The JM-5005 is long body, heavy duty Hydraulic Floor Jack. Automatic overload valve prevents damage to jack. Cast metal wheels and casters maximize durability and endurance. Individually tested to 150% of rated capacity. There is also a 10 TON version of this product available, more info on the JM-5010 is here. The JM-5005's weight is just under 127 LBS. If you have any questions regarding shipping procedures or would like more information on this equipment, PLEASE CALL US AT 1-888-736-5094! Due to size & weight, this product will be shipped by common carrier. For more information about how this item will be shipped to you, it is always best if you call us at 1-888-736-5094 to get a shipping quote and review Complete Hydraulic's shipping procedure with one of our sales associates. It is vital for the customer to understand what is required of them for receiving these shipments! If you have ANY questions about shipping policies or procedures, please see detailed information here or call us at 1-888-736-5094 and one of our friendly sales associates will be happy to help you! *For customers unable to accommodate a large truck at their residential address and have no business address available, we STRONGLY urge them to have their product shipped to a local trucking terminal. The terminal staff will be able to unload the equipment from the truck and onto a truck or flatbed trailer for you at no additional cost, and then you will be able to unload the equipment with no time constraints. Indiana residents must add sales tax of 7% to your final cost. We have great freight rates! This equipment will be delivered by the the best priced trucking company possible at the time of purchase. Again, should you have any questions regarding shipping procedures or would like more information on this product, PLEASE FEEL FREE TO CALL US AT 1-888-736-5094! Thank you!